Crip the Lit launches "little book with big ideas"
A new book, Here we are, read us: Women, disability and writing, creatively explores the sometimes complicated and often neglected relationship between writing and disability. This little book with big ideas features eight diverse, well-known and emerging women writers. They are: Tusiata Avia, Steff Green, Helen Vivienne Fletcher, Charlotte Simmonds, Michele Leggott, Trish Harris, Te Awhina Arahanga and Robin Hyde (the only non-living writer). They are novelists, poets, essayists, playwrights, memoirists and bloggers. The important thing they have in common is that they all share the lived experience of disability. 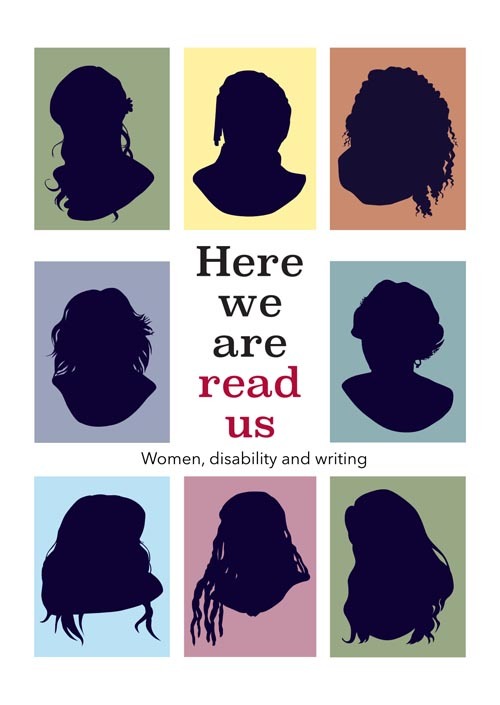 In Here we are, read us, they talk frankly about the intersection of disability and writing, sharing the insights and experience that enrich their work. “Poetry is a language to hang on to when other languages start to disappear. I want to join those who travel light and lift darkness,” Michele Leggott writes. "We have lots to say"
Robyn and Trish call on festival and event organisers to be more inclusive. Here we are, read us was published by Crip the Lit with funding from Creative New Zealand, Whitireia and Weltec Research and Innovation Fund, Rehabilitation Welfare Trust, and Wellington Paraplegic and Physically Disabled Trust Board. It was supported by Arts Access Aotearoa and a number of individuals. It will be available at no cost in a variety of accessible formats: in hard copy including large print; and online as an audio book, an e-book with accessible downloadable files, and in braille from the Blind Foundation. It will be launched in Wellington on Sunday 24 March. Crip the Lit was formed in 2016 by Trish Harris and Robyn Hunt as a way for Deaf and disabled writers to have their unique voices, perspectives and stories included and valued in mainstream writing in New Zealand. We want to tell our stories our way. Crip the Lit is here to challenge stereotyped and inaccurate portrayals of disabled characters in books, movies and on television. It’s critical that disability is represented and celebrated as part of the richness and diversity of humanity in all genres of literature, and in visual media. Disabled writers also need a platform and community, whatever genre they’re writing in. Original generation time 1.7679 seconds. Cache Loaded in: 0.0004 seconds.